There are times when you need to provide access to your home but you may not be there or perhaps just can`t get to the door to let someone in. 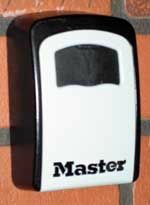 `Leave-a-Key` key safes are a proven and practical solution to the problem of leaving a key safely for others to use. They are used extensively by Local Authorities and other public sector organisations as well as by personal users. Simple to install and operate - choice of models. 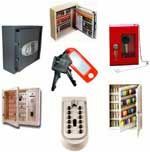 Which Leave-A-Key Key Safe is best for you? Which Leave-A-Key safe is best? 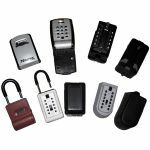 The robust metal housing with its weatherproof sleeve, bolts firmly to your house, keys are deposited and locked securely behind the removable keypad operated face panel. To let authorised people into your home, all you have to do is tell them the code you have set - Simple and Convenient! - No need to arrange key-holders, etc. 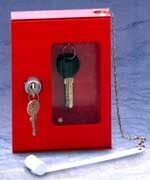 Emergency Break Glass key boxes - these are ideal for leaving a key by fire doors or other emergency exits, where the key needs to be instantly available, but you need to deter thoughtless tampering with or removal of the key. The Leave-A-Key range of key boxes offer an ideal solution for Home Help or Carer Access to the elderly who may not be able to get to the door to let them in. They also offer a practical way to leave a key safely for your children if they have to come home to an empty house after school - avoids the need for them to carry keys to school (and risk losing them!). And of course you`ll never lock yourself out of your house again! NOTE: Storage capacities shown are offered as a general guide only.